This is one of our most subtle options. But that doesn’t mean it doesn’t stand out. Embellished with silver and gold, it’s got its own little sparkle that will help you take advantage of your in-wallet real estate. 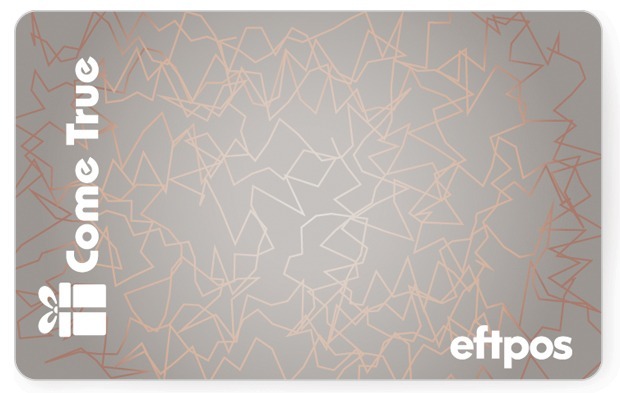 If you want to take full advantage of your eftpos gift card campaign, remember you can easily add a custom letter or wallet to your card order! And of course, never forget the association of gold and silver to wealth and success: this could help make your reward seem even more generous than it is. This one is great for professional contexts, especially for rewards issued to clients. It’s no-fuss in every sense: a minimalist design that requires no design input from your time. It practically rolls off the production line and into your campaign. If it looks like the eftpos gift card for you and your campaign, fill in the enquiry form and we’ll be in touch within one business day with all the information you need to get started. Order today, receive in 5 days*.